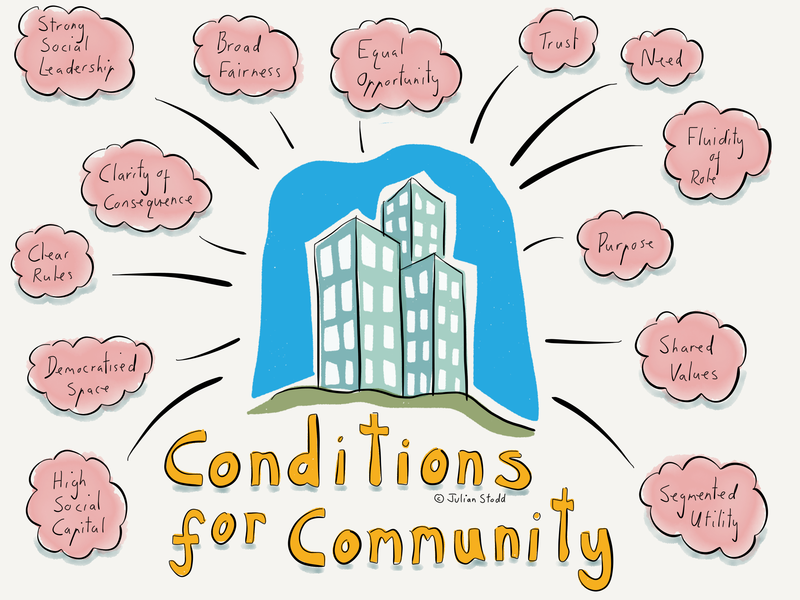 I’m working on some principles for supporting the development of Communities of Practice, so sharing this illustration, which is about ‘foundations’, what are the conditions for Communities to emerge? It’s not intended to be definitive, just part of a conversation about how ‘community’ is more than simply ‘technology’, or ‘space’. We need high Social Capital, something that Social Leaders have themselves, and develop in others: an ability to survive and thrive in social collaborative spaces. Not something to take for granted, and much more than simply technical skills. There is value in having Democratised Space, space which is not owned purely by the organisation: in the Trust research, we see that ownership of the space impact engagement quite strongly, so relinquish some control if you want to win the prize of engagement. We need clear Rules, ideally co-created, or at the very least, explicitly stated. Ambiguity leads to retrenched behaviours, safe behaviours, but not innovative or engaged ones. Consequence is a powerful tool, i’ve been writing about ‘the Sphere of Consequence’ in change recently, and the ownership of it, and location of it, is important. Clear triggering, clear format, clear permanence, and clear ownership of consequence is valuable. We need strong Social Leadership in social communities, which, agin, may be obvious, but the corollary is also true: we do not need an abundance of formal leadership. Leave formal power at the door. Broad Fairness is an organisational wide need, but especially in communities: if the organisation has a culture that is not fair, then it cannot hear all the voices within these communities that it needs to hear. We must have Equal Opportunity: opportunity to engage, to be heard, and to respond. This ties in with the ownership of stories. Communities are not broadcast spaces, they are co-creative ones. Trust is central to coherent communities: focus on building out wide and strong webs of social ties. And a condition for the emergence of community is ‘Need’, need from individuals, not just need from the organisation. Tied into the emergence of agility is the need for Fluidity of Role: we cannot carry our formal role into a social space, and indeed, we see far greater fluidity of roles within these spaces anyway. Fully social communities may not need a Purpose per se, but social ones within organisations probably should, even if the purpose of a Community of Practice is simply to support ‘best practice’, development, application, and reflection. We will find Shared Values within our coherent communities, but we must put the effort in to do so: shared purpose can be imposed, but shared values must be found. Finally, Segmented Utility: if we are all the same, our community will be weaker than if we have a broad and diverse range of skills, knowledge, viewpoints, and perspective. The more segmented a community, but aligned with core shared values, the stronger it will be. This entry was posted in Community and tagged Community, Community of Practice, Leadership, Need, Pride, Purpose, Social Age, Social Capital, Social Leadership. Bookmark the permalink. Exactly right Julian – unfortunately all too often ego gets in the way at the very top of the organization where some level of buy in needs to happen. Thanks for the work you are doing related to community and trust!